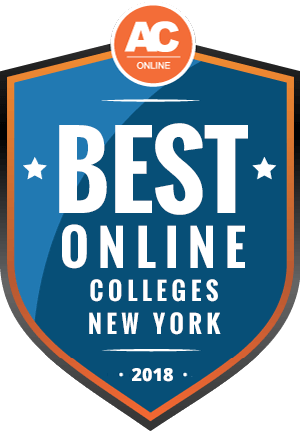 Why Choose New York for Online Higher Education? The Georgetown Center on Education and the Workforce projects that by 2020, 69% of jobs in New York will require a postsecondary education. Earning a college degree is increasingly necessary for individuals who want a well-paying career with the potential for promotion. Prospective students, both in-state and out-of-state, should consider New York schools when researching where to earn their online degrees. Learners will find top online colleges in New York. This page includes a ranking of the best and most affordable online universities in New York. New York offers many completely online programs at a good value; currently, there are 441 exclusively online programs. Students pursuing online degrees in New York include 52,898 undergraduates, 23,319 graduate students, and 913 international learners. The convenience and flexibility of online programs in New York provide opportunities for diverse groups to earn their college degrees, including single parents, full-time workers, people working in shrinking traditional labor industries, and underserved populations. Students will find numerous affordable online programs in New York. In-state students taking online and on-campus courses generally receive cheaper tuition than non-residents. However, some online programs offer tuition discounts to distance students. Students eligible for in-state tuition must live in New York for at least one year prior to their first day of class. Learners can provide proof of residency with an NY state voter registration, NY state income tax returns, NY state residential lease, or an NY state driver’s license. Out-of-state students in neighboring states may qualify for reduced tuition rates due to reciprocity agreements. The data below includes the in-state and out-of-state tuition rates for students in New York. In-state and out-of-state students pay less for tuition in New York than the national average for four-year public institutions, but slightly more for public two-year institutions. Students typically pay the same tuition for both on-campus and online programs; however, distance learners save money by avoiding the commute to campus, living off campus, and bypassing some on-campus fees. The information below provides the current online costs per credit for some schools in New York. Non-resident students looking into attending online programs in New York should consider several factors before making their decisions. These include the anticipated cost of the degree; if out-of-state learners can benefit from reciprocity or good neighbor discounts; and whether their state of residence holds any state agreements or attendance restrictions for online students. Many states participate in regional interstate compacts that give tuition breaks to students in qualifying neighboring states. Unfortunately, New York, along with Pennsylvania and New Jersey, does not belong to any interstate higher education compacts. New York is a member of the State Authorization Reciprocity Agreement (SARA), which sets national standards for postsecondary distance education programs and courses. Membership in SARA is voluntary, and not all states participate. The agreement makes it easier for students to take distance education courses in other states. Students who live in a state other than New York can take distance education courses and programs from schools in New York if their state participates in SARA. We created this list of New York’s best affordable online schools using several metrics. We considered affordability, the number of available courses and programs, and student support services. Use the rankings below to help find the best online program in New York for you. 1 Mercy College Dobbs Ferry, NY 100.00 $17,166 35 86% 17:1 35% yes yes yes Mercy College teaches its students the benefits of a well-rounded education. More than 90 degree programs are covered in five schools—Business, Education, Health and Natural Sciences, Liberal Arts and Social and Behavior Sciences. Students are encouraged to get involved in Community Service Programs as inscribed in its seal: Inserviendo Consumere, which means "consumed in service. Three of the Mercy College locations, Dobbs Ferry, Bronx and Manhattan, offer immediate or close access to the city, where students discover unlimited job and internship potential. The Yorktown Heights campus sits beside Franklin Delano Roosevelt State Park and suits the needs of learners who value a more peaceful setting. Mercy College is one of the best private colleges in New York in terms of the price tag, which is on average half of comparable area colleges. The school connects students with a range of financial aid options, with undergrad student debt a quarter less than state average. The White House has recognized the school as a "Bright Spot in Hispanic Education," and the Department of Veterans Affairs labeled it a "Yellow Ribbon School" for veterans and their families. 2 Nyack College Nyack, NY 99.72 $23,500 4 100% 12:1 42% yes yes yes Nyack College began as and continues to be a Christian centered learning environment. The Seminary and College of Bible and Christian Ministry offer religious based degrees. Schools of Business, Arts and Sciences, Nursing, Social Work, Music and Education allow students to pursue a variety of degrees. The college's online programs are numerous and cover associate, bachelor's and master's degree options for those looking for a more flexible education. Choose from two campuses: Rockland with its peaceful location near the Hudson River and hiking and biking and New York City, in the midst of a bustling city of life and movement. To make the school more affordable, Student Financial Services works with prospective students one-on-one. Higher education learners seeking a solid education while enhancing their spiritual journey should look no further than Nyack College, one of the best colleges in New York for religious learning and living. 3 SUNY College at Oswego Oswego, NY 98.93 $6,170 5 91% 17:1 58% yes yes yes At SUNY College at Oswego, experience an education catered to individuals' needs and strengths. Four colleges, College of Liberal Arts and Sciences, School of Business, School of Communication, Media and the Arts and School of Education, allow students to study from 110 programs in the ways that best suit them as well as expanding their choices with graduate and study abroad programs. The Center for Experiential Learning offers active, dynamic learning outside the traditional classroom that makes students job ready. Extended learning includes online and part-time degrees and college credit programs for high schoolers. Bunk at SUNY College at Oswego's 690-acre campus set against Lake Ontario for a nature immersed learning environment at one of New York's best colleges. 4 SUNY Institute of Technology at Utica-Rome Utica, NY 98.71 $6,170 9 84% 17:1 48% yes yes yes At SUNY Polytechnic Institute of Technology at Utica-Rome, students gather from all over the U.S. and 20 other countries to study the institute's science, technology, engineering and math focused programs (STEM). The Utica-Rome campus sits on 400 acres with buildings alongside forests and wildlife. Only at this campus can be found Quad-C, which is the Computer Chip Commercialization Center that oversees the future of device processing and packaging, IT and supply chain support. SUNY Polytechnic Institute prides itself on diversity and inclusion by offering assistance to military and disabled persons, underrepresented or economically disadvantaged students seeking STEM degrees and bright New York State residents who were underprepared by their education system. More than 85 percent of students take advantage of financial aid, whether from scholarship, grants, loans or part-time employment. The school's Net Price Calculator can help students figure out their financial needs to attend one of New York's best STEM focused colleges. 5 Stony Brook University Stony Brook, NY 98.30 $6,170 14 63% 17:1 66% no yes yes Stony Brook University is a large, well-known public sea and space grant research institution located on Long Island, NY. The main campus sits on 1,039 acres, and houses several notable research institutes, centers and art galleries, along with a variety of living and dining options, with unusual perks such as a travelling Starbucks Truck, food carts, Halal and Jewish dining and a re-usable take-out container program. Over 200 undergraduate, 100 masters and 40 doctoral degree programs are offered at Stony Brook, several of which are offered completely online, or with limited campus visits required. Students looking for online colleges in New York state can expect a top-notch online education at Stony Brook, learning with the latest technology, from award-winning faculty. Online programs are offered at the undergraduate and graduate level, along with advanced certificate and career enhancement programs. Examples of online programs are in areas such as nutrition, nursing, education and business. 6 SUNY College of Technology at Canton Canton, NY 98.16 $6,170 9 86% 17:1 29% yes yes yes Students seeking a career-focused online school in New York with maximum flexibility will find this, and more at Canton State University of New York (SUNY Canton). SUNY Canton Online offers hundreds of online courses along with degree programs ranging from agribusiness management to veterinary service administration. Many online courses through SUNY Canton Online are asynchronous, which means students can log onto the virtual campus anytime, and work at their own pace. Online students are well dialed in, with access to academic resources designed specifically for them, such as 24/7 chat capability with the librarian plus access to an incredible e-library and databases, online tutoring, academic advisement, and virtual career fairs and conferences. Campus events can be viewed online by virtual students; participation in collegiate level video game competitions through the eSports team and connecting through online clubs and organizations via RooLife are some other nice online student perks. Online students can also take place in the yearly Scholarly Activities Celebration, with the option of presenting their work either online or in-person. 7 Saint Joseph's College-New York Brooklyn, NY 96.69 $22,200 7 94% 11:1 72% yes no yes Students searching for online colleges in New York should research Saint Joseph's College-New York (SJC) in Brooklyn, as it is considered one of the region's best. SJC combines a solid liberal arts education with affordability, while also offering a vibrant location, accreditation, tuition deals, flexibility and small class sizes. Through SJC Online, students from anywhere, including SARA states, can earn undergraduate and graduate degrees, dual degrees and certificates online, with tuition offered at a significantly lower cost per credit than those earned on-campus. SJC online students may be eligible for federal loans and grants, plus New Yorkers enrolled full-time may qualify for the Tuition Assistance Program (TAP) and part-timers can apply for the Aid for Part-Time Study (APTS) program. SJC also offers active military duty, guard and reserve students a big tuition break, and with SJC's liberal transfer credit policy, students can also earn credits for experience. To determine eligibility, SJC online students can take the Prior Experiential Learning Assessment (PELA), or can submit professional certifications from on the job training, military training, CLEP and/or DSST exams. 8 Metropolitan College of New York New York, NY 96.04 $17,280 8 76% 10:1 19% yes yes yes While those seeking online colleges in New York have plenty of options, students looking for an education geared towards working professionals should check out the Metropolitan College of New York. MCNY is all about helping students achieve their educational goals, while also preparing them to work in their chosen fields as quickly as possible. On-campus or hybrid programs are offered here, combining online learning with campus visits. Students can transfer in credits earned online at other institutions, and may also qualify for an enhanced tuition award. Classes are available full or part-time, in the evening, on the weekends, and online. Undergraduate and graduate degree programs are available at the associate, bachelor's and master's degree level, in areas such as business, education, public affairs and human services. Accelerated curriculum is key here. For example, you can earn an AA in human services in 16 months, a BBA in IT management in 2 years, 8 months and a dual childhood/special education MS in one year, with full-time enrollment. 9 SUNY Empire State College Saratoga Springs, NY 95.87 $6,170 15 77% 15:1 16% yes no yes At SUNY Empire State College (ESC), students have the unique advantage of taking part in building their own undergraduate associate or bachelor's degrees. Basically, the college offers several areas of broad study, and within those areas, students can tailor their degree towards a specific area of study and concentration. Some courses offer independent study options, study groups, residencies and retreats. A key element of ESC's customizable programs is to award credit for prior learning experiences and maximization of transfer credits. Students take an educational planning course, plus work with a faculty mentor from program start to finish, to ensure student's goals are met. ESC is part of the State University of New York (SUNY) system, and has over 30 learning centers throughout the state, plus several degrees offered completely online, for those seeking online colleges in New York. In addition to associate and bachelor's degrees, master's degrees and advanced certificates are also available completely online in areas such as business, leadership and education. 10 SUNY at Albany Albany, NY 95.03 $6,170 4 58% 18:1 66% no no yes SUNY at Albany (UAlbany) is in New York's capital city, which lends itself to many opportunities for student internships and public service. The college is a large, premier research institution with three campuses, including the impressive Health Sciences Campus. UAlbany students can go for bachelor's, master's and Ph.D. degrees in areas such as biology, psychology, history, business, public health and computer engineering. For students looking for online degrees in New York, UAlbany has several online master's degrees and advanced graduate certificates in education and public health, along with a BS in informatics/IT. In addition, on-campus students can take advantage of individual online courses, which are delivered through the Blackboard Learn platform, and are carefully orchestrated to minimize barriers and increase successful online learning. Online students have access to UAlbany resources, including advisement, the disability resource center, the writing center and the college library, via phone, e-mail, or the internet. Online tutoring is through Star-NY, an online tutoring consortium. 11 CUNY Graduate School and University Center New York, NY 92.45 $6,030 7 N/A 8:1 N/A no yes yes The CUNY Graduate Center (GC) is the main graduate level institution in the City University of New York (CUNY) system. GC is also home to several prestigious research centers, institutes, initiatives and committees that focus on social and civic issues, culture and science. As far as degree choices go, GC offers several master's degree programs in the areas of social sciences, humanities, liberal studies and sciences, and over 30 doctoral degrees in natural and social sciences, humanities and the arts. Almost all courses are on-campus, with classes offered at the main campus, along with other locations throughout the area. Juggling graduate work with life can be difficult, to say the least, and CG makes every effort to support its students-financially and otherwise. All students entering a humanities, sciences or social sciences doctoral program at GC are eligible for free tuition and health insurance through its 5-year Fellowship plan. In addition, students may be eligible for summer funding, stipends, research support, psychological counseling and health insurance free of cost. We answered some of the most common questions students have when looking into online colleges in New York. Use this FAQ to learn what to expect when earning an online degree in New York. Do online credits cost more or less in New York? Credit costs vary by school and program. Completely online colleges in New York sometimes charge less per credit than traditional brick-and-mortar schools; however, schools that offer both online and in-person degrees often charge the same tuition rate to distance and on-campus learners. Some schools charge online students technology fees per class that make tuition more expensive. Online learners can save money in other ways, such as not paying for the cost of commuting, parking, on-campus housing, and childcare. Distance students often have the option to finish their degrees at a more accelerated rate; learners who finish their degrees more quickly can save money on tuition. Which New York schools accept the most transfer credits? Most online colleges in New York accept transfer credits from regionally accredited schools. Students transferring from one SUNY or CUNY institution to another typically find the credit transfer procedure simple. Schools in the SUNY and CUNY systems tend to accept the most transfer credits in general. Transferring credits from one school system to another, or from a public school to a private one, can prove more difficult. Check with the office of admissions to find out about course equivalencies and which or how many credits will transfer. Will any online colleges in New York accept a GED? Most online colleges in New York accept students who hold GEDs in lieu of high school diplomas. Getting into some of the more competitive New York schools might prove difficult, however. Some online schools in New York that accept applicants with GEDs include New York University, Hunter College, Rockland Community College, SUNY Polytechnic Institute, and Alfred State College. How many academic terms per year do online colleges in New York offer? Most online programs in New York follow the same semester schedule their home institutions follow for in-person courses. Purdue University Global, a 100% online, accredited school, offers new start dates every month, and Walden University offers four start times a year for some programs. Other online colleges in New York offer frequent start dates. Which online colleges in New York will accept the FAFSA? Students fill out the Free Application for Federal Student Aid (FAFSA) to help determine their eligibility for federal financial aid, including student loans, grants, scholarships, and work-study. Schools use the information on the FAFSA to determine students’ financial aid awards. Most accredited nonprofit colleges and universities in New York accept the FAFSA. Are there any free online classes I can take from New York colleges? Many students find it helpful to take a free online course, to see if distance learning works for them before they commit to enrolling in an online degree program. A variety of New York colleges offer free online classes. Columbia University offers free courses through edX, in topics like machine learning, corporate finance, artificial intelligence, the Civil War, and investigative journalism. How can I find the online program options at New York colleges? Students can find more than 500 online degree options at 64 different institutions by using the Open SUNY website. This searchable database lets students browse by academic subject and degree level. It has information about transfer credits, tuition and financial aid, and frequently asked questions. Open SUNY also offers special services to members of the military and veterans, and has dedicated counselors with expertise in helping students use the GI Bill®. Students who need help paying for their college education in New York should start with the FAFSA, and then look to Pell Grants, which do not have to be repaid. Students who lack eligibility or who want to pursue an advanced degree can find scholarships specifically for schools in New York. FSCNY offers this scholarship program to high school students in New York City, Rockland, Westchester, and Nassau counties. Applicants must demonstrate community service and academic achievement. Students also interview with the scholarship committee. New York offers these scholarships to students who graduate from a New York high school and are New York residents; U.S. citizens or eligible non-citizens; in good academic standing; and full-time undergraduate students at an approved New York college or university. The New York TAP provides financial assistance to New York residents attending postsecondary institutions in the state. Students must be U.S. citizens or eligible non-citizens; in good academic standing; enrolled in least 12 credits per semester; and meet income eligibility. The WTC Memorial scholarship aids children, spouses, and financial dependents of victims of the WTC attacks in 2001. This includes killed and permanently disabled victims. Applicants must study at a school in New York, take 12 or more credits each semester, and be in good academic standing. New York offers tuition awards to state residents who attend a participating private college in New York. Applicants must be U.S. citizens or eligible non-citizens; have an adjusted gross income of $110,000 or less; and take at least 12 credits per term.